Simple Pork Chops with Wilted Escarole (serves 4) | Crappy Kitchen - Good Dinners! 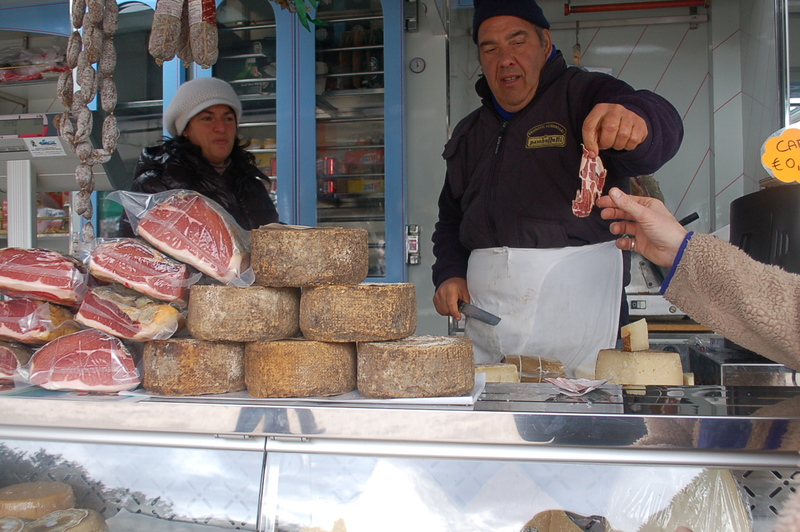 My cooking has changed since moving to Cortona, Italy. I have always cooked in a very spontaneous way, but never more so than now! My new habit has to do with the way this little town works. The shops open early, and if you want fresh bread and pastries, you should really get there in the morning. The fresh fish is here in the piazza on Wednesday and Saturday mornings, and, if you want the best pick of chicken legs or pork chops, you need to check in everyday. I love getting up and taking the short stroll down to the center of town. I stop in for a frothy cappuccino, and, armed with little shopping bags, I make my rounds. I have been trying to learn the names of the different pastries, vegetables, and cuts of meat. I’m sure by the time I am ready to go home I will have them all down! I have no plan for dinner until I make my morning purchases. This particular day, the pork chops looked delicious, and this head of escarole practically jumped into my arms; chops and escarole it is! And so, this is how my cooking has been going here in my new hilltop city. Lazily shopping, and cooking while sipping on my new favorite aperitif, and, last but not least, spending time with my lovely family, along with dear old friends mixed in with some great new ones. 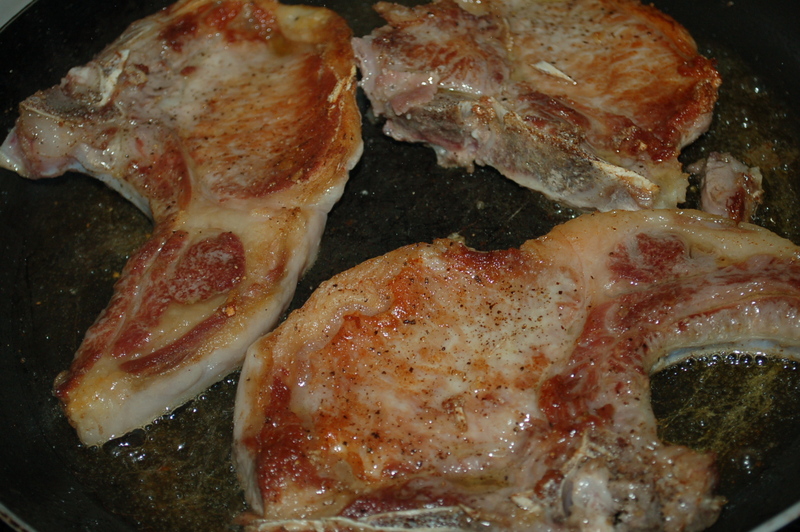 You will need: 4 pork chops, (this would also work with six chops. If you do, add more onions), 4 (or more) tbs extra-virgin olive oil, 2 tsp sea-salt (I used Maldon sea-salt flakes), several grinds cracked black pepper, 8 small onions, peeled & left whole, 6 cloves garlic, left whole in skin, 1 cup white wine, 1 cup chicken broth, 1 sprig fresh rosemary, 1 head escarole, 1 tsp cayenne pepper flakes. 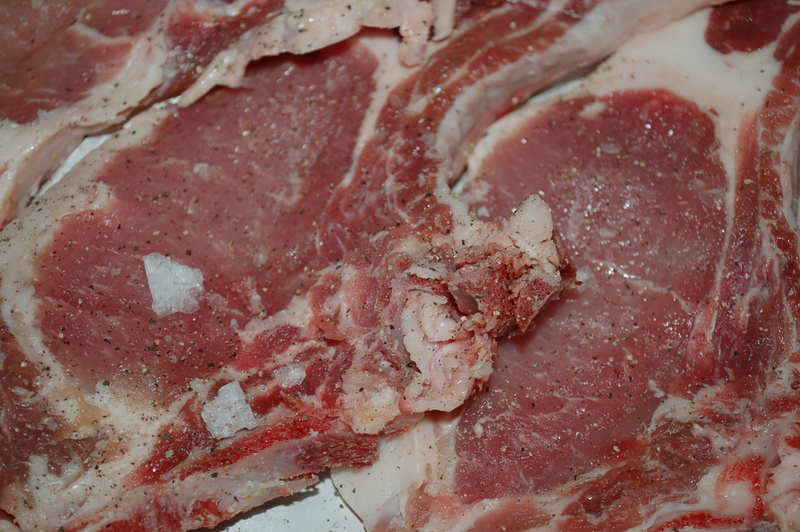 1 – Season meat with salt and pepper. 2 – Put saute pan on high heat and add about 2 or 3 tbs of oil. When it is hot, add the chops in a single layer. Sear on both sides until nicely browned. Transfer to a heavy pot or casserole. 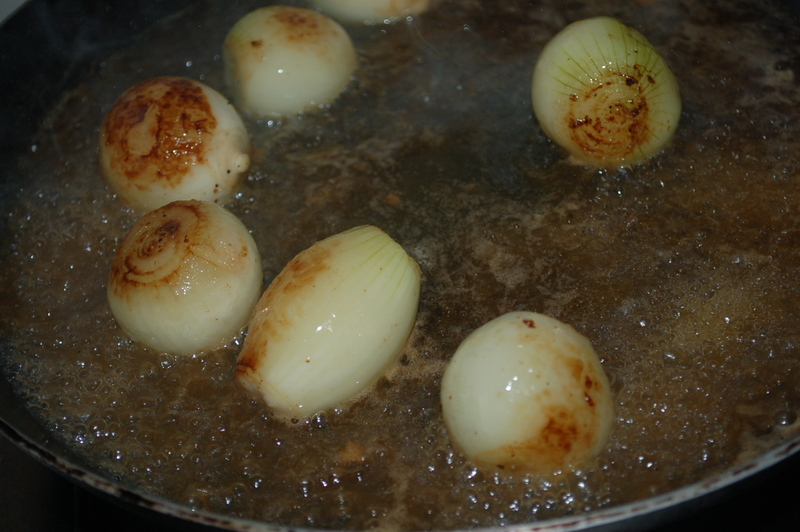 3 – Turn heat down and add the onions. Cook until starting to brown on all sides (about 10 minutes). Add the rosemary at the end of the cooking time. 4 – Add the wine and boil until it is reduced by half. Add the broth and bring back to a boil. 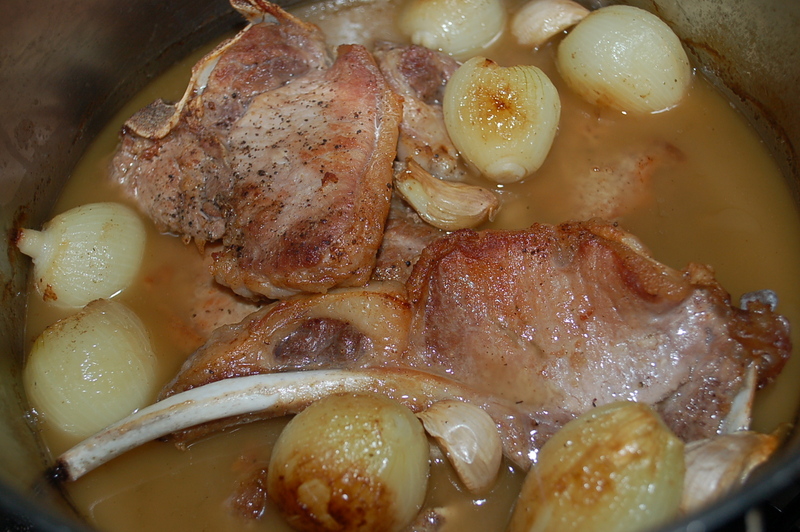 Pour liquid with onions over chops. Cover and place in oven for 45 minutes, or until the meat is tender. 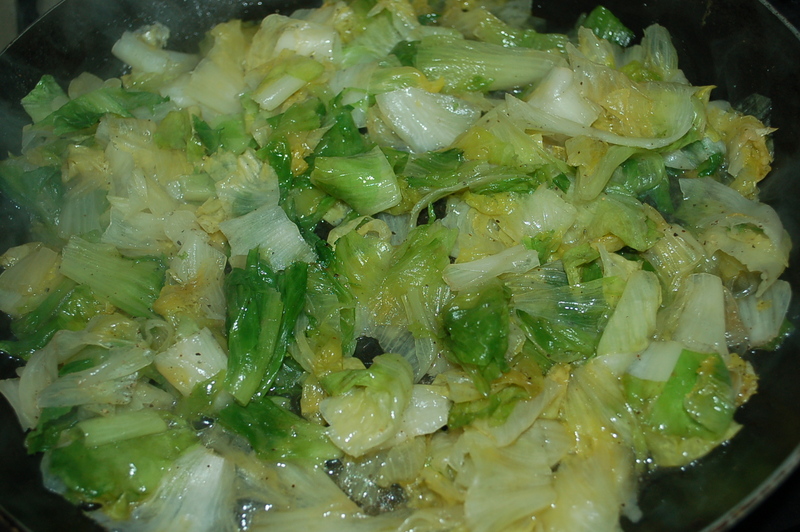 5 – While meat is cooking, wash the escarole and roughly chop. 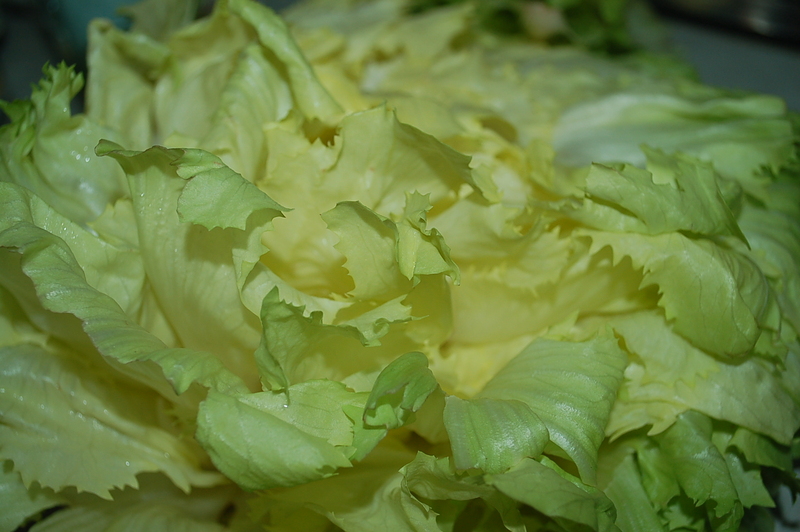 Put about 1 1/2 cups of water in a big pot and when it comes to a boil, add the escarole and cover. Simmer for about five minutes. Put big saute pan on medium heat and add 2 tbs of oil. Add the drained escarole and cayenne pepper flakes. Cook for another 5 minutes, stirring occasionally. Taste for addition of salt and pepper. Serve each person a chop (serve 2 if it is for two people), a couple of onions, some rich flavorful broth, and a side of escarole. This can also be served with rice, pasta or crusty bread. This entry was posted in dinners, Italy and tagged cortona, easy dinner, escarole, Italy, pork, pork chops, simple dinner, white wine in sauce. Bookmark the permalink. Lovely recipe and shopping habits that we all should practice. 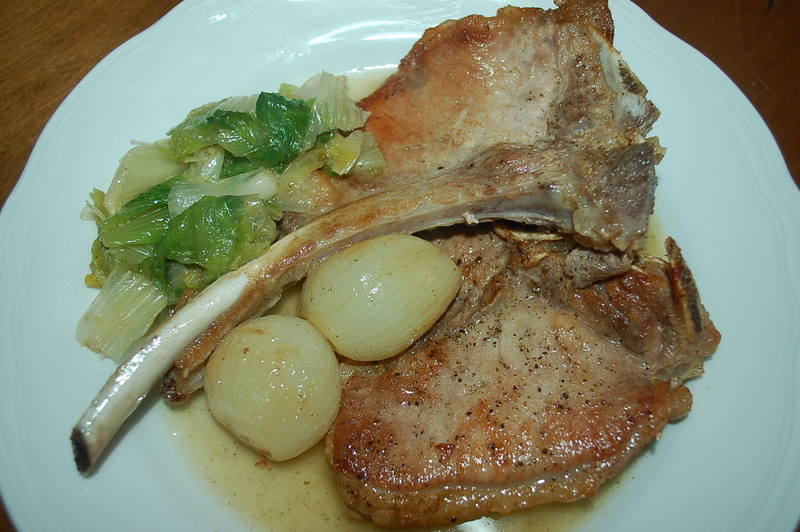 Next time the pork chops look toothsome, the escarole crisp and small onions are at my market, I’ll make this dish. I buy the freshest products available and then compose the meal. The photos in this blog are luscious. Thank you! Thank you for your lovely and thoughtful comment. I know it is a little bit of a chore to shop by seat of your pants as it were, but it makes for really good food, with little effort! 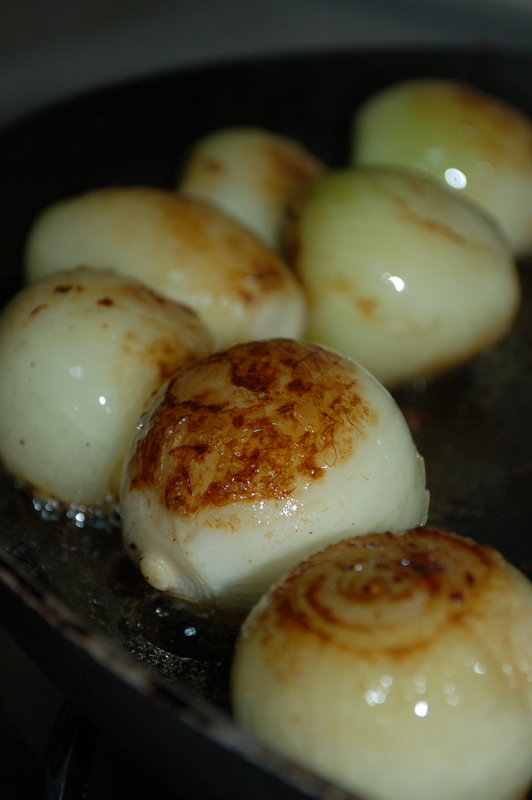 As for the onions, you can always use bigger ones and chop them in half or quarters; just as good, if not as pleasing to the eye. Salute, Tess!